Creator Direct: Brubaker and Phillips tam up for new crime book. Brubaker and Phillips tam up for new crime book. Broadcasting live from Comic-Con San Diego! Universal Studios buys option for Tag comic! Amazing Screw on Head trailer is online! Mignola's Amazing Screw On Head, on SciFi! Tony Lee interview up at Newsarama! Rob Osborne has entered the building! The news has been out for a while, interviews, press releases, the whole lot. 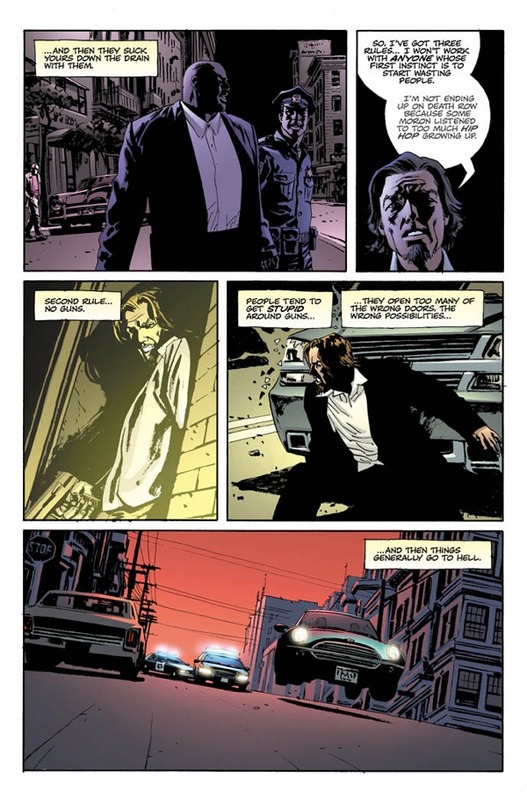 But I wanted to make sure I gave a public plug for the new book Criminal by Brubaker and Phillips. "So, you say, "Yeah, Daredevil's okay, and I like Captain America, but I really dug Ed Brubaker's crime stuff. In fact, the stuff he did, when Sean Phillips illustrated, like in Sleeper…man, if only he'd do another book like that." "If only" now means a wait until the beginning of October, when Brubaker and Phillips' Criminal kicks off under Marvel's ICON imprint. In many ways, the new ongoing series is a throwback to Brubaker's earlier days of writing comics…and his earlier days before that, too…but with a polish that years of experience now bring. We spoke with Brubaker for a look inside the new series, as well as got a first look for Newsarama readers at the five-page trailer he and Phillips created for the series." Read the interview, and download the PDF from the Newsarama site.